Every place has its standard late night food. In college, my partner and his friends always ate at a particular Wendy’s when he got all snacky late at night, and in grad school his housemate would make a signature bean dip. In Chicago, tacos are the late night/early morning snack of choice. In Albany, there’s a burrito place with killer sweet potato fries, and in Cambridge, Mass, every serious night on the town ends at Hi Fi Pizza & Subs, which is disgusting but always open when you want it to be. Cambridge and Oxford have a shared signature late night food, and last night I ate it for the first time since 2004. Its best when purchased from a truck, but the Mega Meals on Grafton St. will work in a pinch. You get fries in a really toxic styrofoam container, sprinkled with shredded mystery white cheese. You slam the top of the container shut for a few minutes, during which time the cheese melts and forms a sloppy and delicious crust across the top of the fries. And then you enjoy. Chips & cheese aren’t just an Oxbridge thing, but I imagine that, with all the students, its a lot easier to come by in university towns. And while non-UK readers might be tempted to suggest that cheese and chips is no different from cheese fries, they would be wrong. Chips and cheese is a ritual as much as a food, and the consistency of the final product isn’t the same as what you get when you order cheese fries in the states. Most of my favorite foods from study abroad have really held up to scrutiny: Pimms, digestive biscuits, and Smarties are all about as good as I remember. 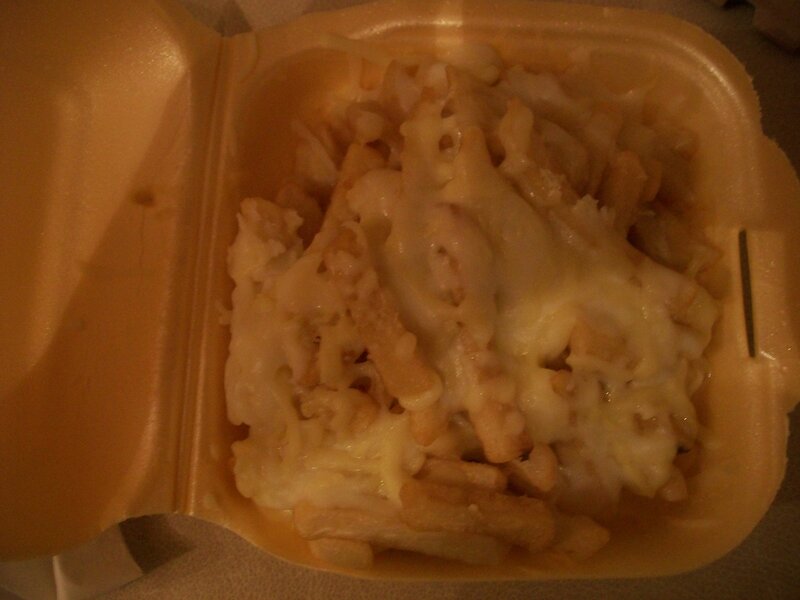 But cheesy chips really deliver when you’re hungry at midnight, the way almost nothing else can.